Boil whole potatoes until tender when pierced with a knife. Lay the potatoes out onto a foil lined baking sheet and gently press down with a fork or spatula just until the skin breaks. The potato should still hold together not be mashed. 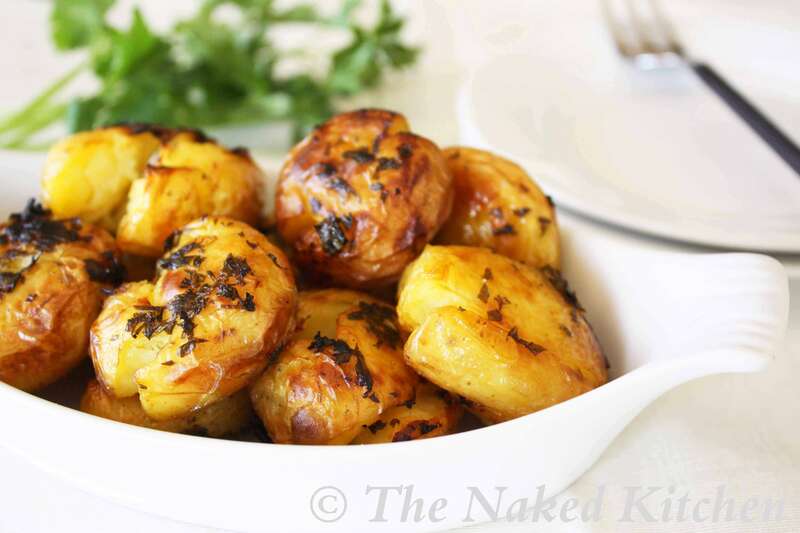 Brush the oil mixture on each side of the potatoes and bake 10 minutes. Turn over and bake 10 minutes more or until golden brown. You can also do this in a non-stick pan on the stove if you prefer. Serve topped with a sprig of fresh parsley if desired. Store leftovers in an airtight container in the refrigerator for 2-3 days. Reheat in the oven or in a skillet for best results.